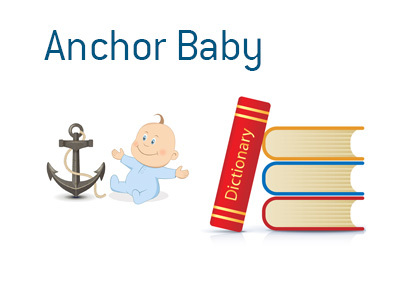 Anchor Baby - What Does It Mean? What does the term "anchor baby" refer to? What is meant by the term "anchor baby"? In some countries, such as the United States and Canada, children who are born in the country are automatically given full citizenship, regardless of the nationality of the parents. At the age of 18, these kids are able to apply for their parents to be given citizenship as well. This has sparked a "birth tourism" industry, where people from countries such as China will travel to the United States or Canada in order to give birth. In addition to their children receiving citizenship, the father and mother will both become eligible to receive citizenship when the child turns 18. In addition, some will travel to countries such as Canada to give birth in order to have access to superior health care. Some countries have made moves to stop "birth tourism", though other countries are still being exploited.